22 Netflix Titles to Celebrate Mini Milestones+DIY chocolate dipped pretzels. As we go through our lives we experience many different milestones and events. Some we get to enjoy with our families while others are more personal and experienced alone. There are the graduations, births, deaths, job promotions, new homes, old homes, new cars, used new cars and more. Then there are the firsts that we all experience. Because as we go through life there is going to be a first time for everything that happens in our lives. The first kiss, first date, first crush, first job, first car, first time on a plane, and so on. When we build our families we get to share many of our children’s firsts with them. These milestones become the memories that we take with us into the future. This month Netflix is promoting all the “mini milestones” in life through a great selection of movie titles. Do you remember the losing your first tooth? I sure don’t, but I do remember when my son lost his first tooth. It was one of those many moments you experience as a parent tell you that your kids are growing up. For him he was filled with excitement and questions about the tooth fairy. On Netflix you can find a great show called “Super Why” (from PBS) that has an episode all about the tooth fairy. Super Why was one of my kids favorite shows to watch when they were little. In the animated show Wyatt and his pals solve problems by looking at classic fairy tale stories. The show is not only entertaining but educational as well. The episode about the Tooth Fairy would be great to share with your kids before they start loosing there baby teeth. Another mini milestone that your kids may experience is dealing with a new baby brother or sister. You know when that new sibling comes into the house and you’re not the center of attention any longer. Okay, so maybe I’m speaking from experience but anyone that has a younger brother or sister went through this at some point in their life. When my daughter was born this was another milestone that we all got to share as a family. For each of us the experience was different. For my son it was all about having a new baby sister. For any of you expecting a new addition to your family there is an episode from the animated series “The Hive” that deals with this issue in a fun and enjoyable kid friendly way. 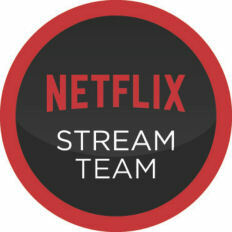 You can watch that episode of “The Hive” and others on Netflix. Now children are not the only ones that have milestones. As adults we go through our own mini milestones. One of the most exciting and stressful times for my wife and I was when we were looking for a house to buy. There were so many appointments with real estate agents to see houses. Then there were the meeting and phone calls with banks and mortgage brokers to see what kind of house we could afford. At the beginning it seemed like we would never be able to find an affordable house. But in the end everything worked out. There is a series on Netflix that specifically deals with first time homebuyers as they navigate the waters trying to find their dream homes. The show is aptly called “House Hunters”. Watching the episodes now definitely brings back some memories to our house hunting days. Now the show isn’t all about first time homebuyers. There are several episodes that feature people looking for that second home whether it is for investment or vacation purposes. In life we go through many different ups and downs and get a chance to experience them with the ones we love. Maybe it’s the night before your new job and you need some comic relief with “The Office”. Or maybe you and your husband are having some difficult times being a parent and need some laughs from the show “Parenthood”. Whatever the mini milestone, whatever the challenge you are having rest assured there are many of us out there who feel the same way. Take advantage of the great titles available on Netflix that can help you and your family enjoy these moments. Just remember that life is too short to get caught up in all the drama. We all need to remember to sit back, relax, and enjoy the show. 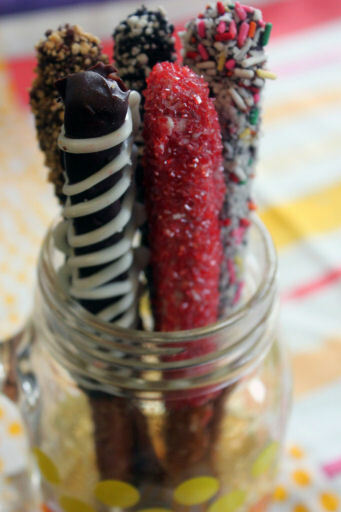 Mini milestones deserve a mini reward, like the sweet-salty combo of chocolate-covered pretzels. Make them extra special by rolling pretzels in your kids’ favorite treats – from Oreo dust and coconut to chopped nuts and sprinkles, the sky’s the limit. Click here to learn how to make your own.